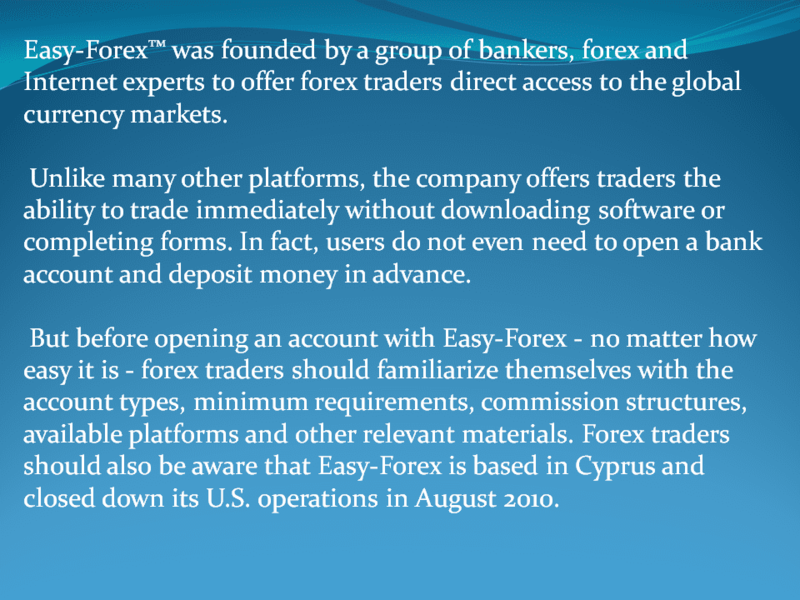 Easy Forex or EasyMarkets, a trading services provider online, was started in 2003, with its head office in Cyprus. It has offices and centers for support in more than 160 countries. Its providers for liquidity are Swiss-based UBS and Scottish The Royal Bank. Easy-forex obtained its license from CySEC in its home-base country, MiFID is responsible for licensing the company in Europre while Australias ASIC is responsible for Oceania’s largest country license. Accounts are based on levels of traders’ experience and ability to get to fullest of the certain account. Standard account on easy-forex has $25 for a minimum to deposit. VIP account, being a step ahead of the Premium account, has 1.8 pips spread, while 2.5 pips are for Premium account. There is also a regular demo account, which comes usable on mobile as well as desktop. Easy-forex offers to its demo-account clients personal trainers, guarantees stop-loss, as well as other features provided close to what can be found on an actual account. There is option to open an account to trade according to Islamic non-interest-included law. This account works so that when extending day trading deals to the next day, rolling fee isn’t charged. However, maximum time given to day-trading is mostly one week, which shortens or extends according to which currency pair is being traded. Just less than 200 products can be chosen among which are currencies, metals, commodities, as well as options. Commodities include oil and gas (WTI Crude, Brent), gasoil and heating oil with a couple of energy commodity trading pairs like Oil/USD or XAU/USD and more. Easy-forex offers several agricultural commodities including coffee, cocoa, or corn. Easy-forex has a trade simulator that allows traders to avoid risk while exploring how the platform for trading at easy-forex works, which is most beneficiary to novice traders. “Inside Viewer” is a feature that shows the currency pairs most traded, or to visually adjust the strategy for risk management, there is a “Trade Controller”. Educational tools for traders include videos that can help even serious and experienced traders, as well as novice traders. There is a forex guidebook to be downloaded as an eBook in which newbie traders can find the basics of trading and tips for better experience in trading at Forex. There are webinars offered which also enables traders to get in contact with other traders to share experience with. Easy-forex also organizes occasional expos in order to enable traders to meet and exchange their views. The expos are organized in different locations, and are announced on the webpage. There is also a section for traders to read on many different topics about Forex trading. As for bonuses and promotions, easy-forex has (had) a bonus of 20% on a deposit of maximum $2000. Another version called “win-win”, when a trader deposits first funds and executes the first trade – if it’s a win, easy-forex would double that win, and if the trader loses easy-forex refunds as much as $200. 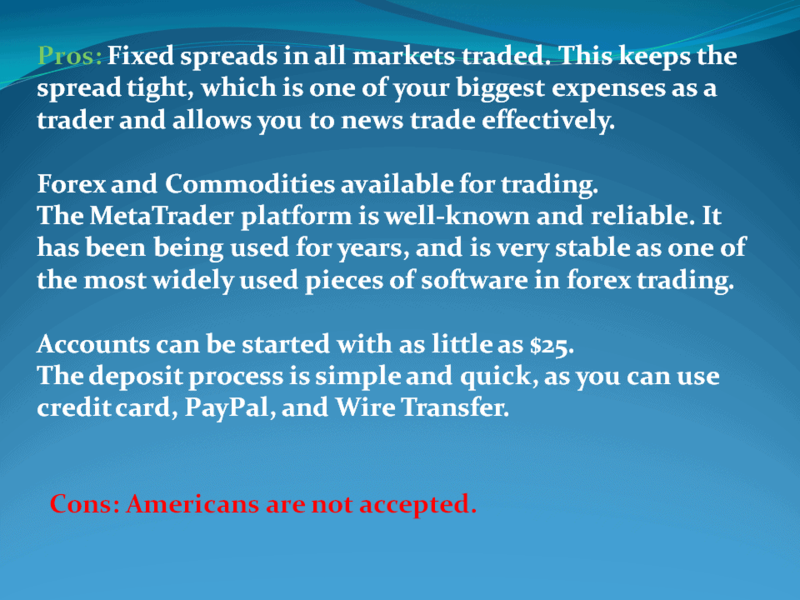 Also, for trading option, easy-forex offers $300 risk-free for starting an account. There is also affiliate program offered by easy-forex, which means that a trader can get as much as $600, and there is also “introducing broker” option that lets a trader get as much as $100 of lot rebate. Partners’ commission is ten percent from sub-affiliates. For referring through refer-a-friend feature, you can get between $50 to $500 depending on how much your referred friend deposits, with the minimum being $200 and max $500. To deposit your money, if you don’t prefer using credit cards, you can place funds through bank wires. Easy-forex accepts as much as 12 currencies. To withdraw your money, you need to fill out a form online. It is possible to withdraw money the same way deposited, and it goes without fees or any further commission. Customer support is available all the time. Two offices to be reached by phone are located – one in Limassol with another one in Sydney. 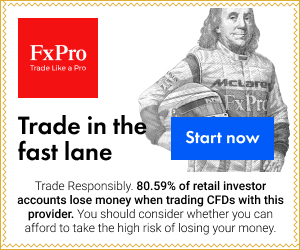 Of course, sending an email will give you a prompt answer, and there is an option to send snail mail to easy-forex’s Marshall Islands address. You can reach the support team with the live-chat as well. One thing to note is that trading indices and commodities is conducted as CFDs. It settles 2 working days before underlying the expiry of the exchange, which is GMT at noon. Each CFD has clearly stated the expiration in the open positions trade ticket and at MetaTrader 4 market watch. The expiration of options is considered at New York time 10 A.M.
How to read Economic Indicators in forex trading ? Risk Warning: Trading leveraged products such as Forex and CFDs may not be suitable for all investors as they carry a high degree of risk to your capital. Trading such products is risky and you may lose all of your invested capital. Before deciding to trade, please ensure that you understand the risks involved, taking into account your investment objectives and level of experience.